"Our challenge was to maintain the openness of the original duplex space, while at the same time guarantee adequate privacy for our clients," said the firm. "We achieved this by the use of continuous compact storage volumes on both the lower and the upper floor." 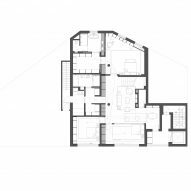 Visual emphasis is placed on the staircase connecting the apartment's two levels. It doglegs up a double-height space topped with a skylight, and features white perforated side guards. 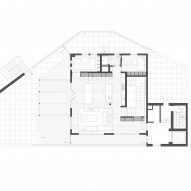 "The family room is a a dramatic, light filled double-height space, which includes the connecting stair to the second floor, thus becoming the central core element of the project, giving it an extremely open, loft-like feeling," said the studio. In the middle is a large open area for entertaining that includes the kitchen, dining and living spaces, which open onto a decked terrace. Tucked away are private relaxation spaces and the building's main circulation core. 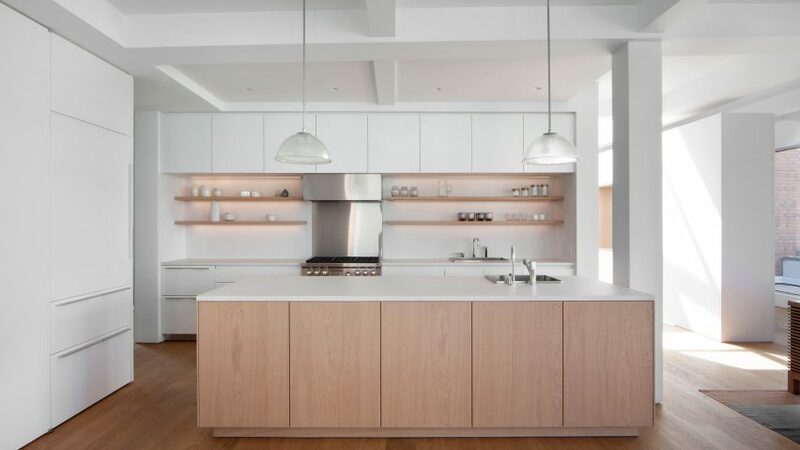 "The use of only three materials, white plaster walls, oak for both floors and millwork, and smooth concrete floor, helps creating a very luminous space, giving it an almost ethereal flair," Space4Architecture said.